Before starting the work, make sure that the ignition switch is off and depress the brake pedal more than 20 times. As high pressure is applied to the No. 1 brake actuator tube, never deform it. 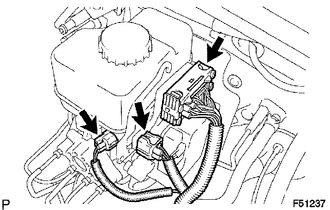 Do not turn the ignition switch to ON until the work is completed. When pressure in the accumulator is released, reaction force becomes lighter and stroke becomes longer. Immediately wash off any brake fluid off immediately that comes into contact with a painted surface. 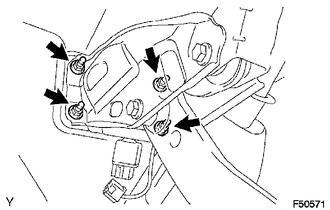 (a) Disconnect the 3 connectors from the hydraulic brake booster. 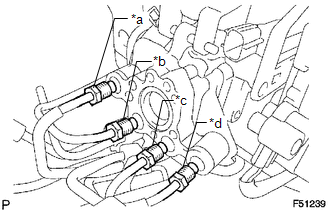 (b) Using a union nut wrench, disconnect the 4 brake lines from the hydraulic brake booster. (c) Use tags or labels to identify the place to reconnect each line. 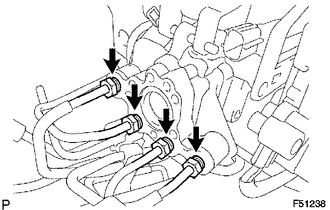 (d) Remove the 4 nuts and pull out the hydraulic brake booster. (e) Remove the brake booster gasket.